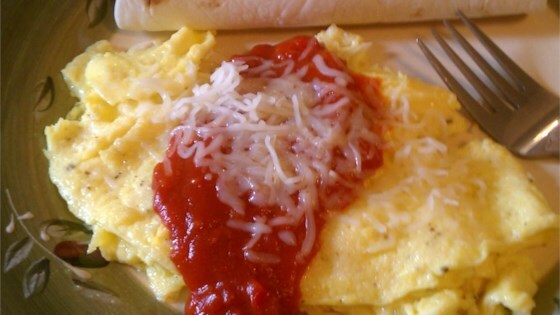 "A perfectly easy omelet for a Sunday morning! This was a favorite in our family for years. The results will impress both kids and adults! You may also add garlic and hot sauce for a more jazzy flavor." In a skillet or frying pan, melt butter over medium heat. Add green pepper and onion; saute until tender. Stir in tomato sauce, sugar, Worcestershire sauce and cayenne pepper. Simmer until sauce has thickened, about 10 minutes. While sauce is cooking, beat together eggs and milk. Heat a lightly oiled 6 inch skillet over medium heat. Cook four small omelets, one at time, in the skillet. Season each with salt and pepper and keep them warm while the others are cooked. Serve warm with sauce spooned over each omelet. Savory squares of baked eggs, mushrooms, olives, ham, jalapenos, and cheese. Recipe is good but is not spanish omelet at all. A fast and easy weekend breakfast! I used a small saucepan for the sauce and omitted the green pepper.